While on one of the escorted tours to Eastern Europe, consider visiting Josefov. It occupies an extremely relevant place in the history of the Czech Republic. 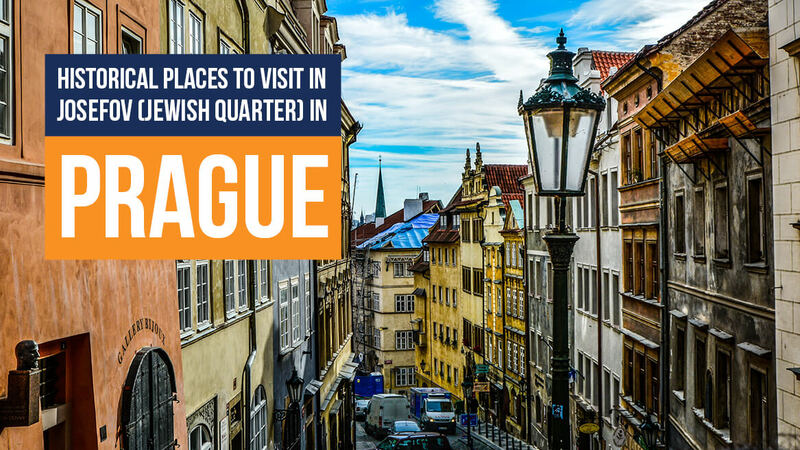 Located between Prague’s Old Town Square and the Vltava River, the history of this Jewish Quarter starts with the 13th-century order for Jewish people to settle in one region. Besides Jewish people from Prague, those banished from Moravia, Germany, Austria, and Spain settled here too over time. Huge parts of Josefov, aka the Prague Jewish Ghetto, were destroyed and remodelled over the centuries, but the most significant structures survived. Today they form the Jewish Museum in Prague, the best preserved complex of historical Jewish monuments in Europe. Here are some of the places you ought to visit in Josefov. The Ceremonial Hall was built in the neo-Romanesque style in 1906-08, next to the Old Jewish Cemetery. There once stood an old mortuary used by the Prague Burial Society, founded by Rabbi Eliezer Ashkenazi in 1564. Becoming a part of the Jewish museum in 1926, the Ceremonial Hall does not serve its original purpose anymore, but its permanent exhibition focuses on the history of the Prague Burial Society as one of the ghetto’s most relevant religious and social institutions, and tells the story of their life and work through the exceptional series of paintings from the 1770s. Visitors interested in unique relics can see the 14th-century fragments of Prague’s oldest tombstones there. Finally, visitors will find a map of preserved Jewish cemeteries in Bohemia and the memorial prayers for the dead, all exhibited in the Ceremonial Hall. There are six synagogues in Josefov, and the Old New Synagogue is Josefov’s most famous synagogue, Central Europe’s oldest preserved active synagogue, and the oldest surviving medieval synagogue. In addition to that, when it was completed in 1270, it was one of first early Gothic edifices in Prague, with rich stonework and antique furnishings. Not only the exquisite exterior, but its magnificent and highly symbolic interior is worth your visit as well. Today, the Old New Synagogue is one of the most valuable world Jewish monuments and local Jewish community’s main synagogue. Legend says that in the attic, where the genizah of local community is kept, the body of Golem created by Rabbi Judah Loew ben Bezalel lies. The attic too is now open to public. Built in the late Gothic style in 1535, the Pinkas Synagogue is the second oldest preserved synagogue in Prague. It was founded by a prominent member of the local Jewish community, Aaron Meshulam Horowitz, as a place of prayer for his family, and was likely named after his grandson, Rabbi Pinkas Horowitz. In 1955-60, the Pinkas Synagogue became a memorial to 78,000 Holocaust victims from Bohemia whose names were hand-written on the walls of the synagogue. Designed by painters Jiří John and Václav Boštík, it is one of the first such memorials in Europe. The permanent exhibition tells the story of the Jewish children who were taken to the Terezín Ghetto. It is based on these children’s drawings that were created in 1943 and 1944 in the concentration camp during the classes taught by the artist Friedl Dicker-Brandeis. Situated next to the Old New Synagogue, on the corner of Maiselova and Červená streets, the Jewish Town Hall was constructed in 1586 in Renaissance style, thanks to the wealthy communal leader Mordechai Maisel who sponsored numerous buildings in Josefov. It is assumed, however, that the basement of the Town Hall was built in the 13th century along with the Old New Synagogue. The Jewish Town Hall was burned down in 1689, but rebuilt in baroque style, with the rococo facade added in the 18th century. This structure reflects the history of the entire Jewish ghetto. Destroyed and rebuilt numerous times, the ghetto was demolished in the 19th century, with only few buildings surviving, including the Jewish Town Hall, which is once again the centre of the local Jewish community and a seat of the rabbi. The building is well known for its two clocks – one with Roman and the other with Hebrew numerals. There is a large Jewish library there, as well as a dining room on the ground floor. Franz Kafka, the celebrated German-speaking Bohemian Jewish writer, was at birth a citizen of the Austro-Hungarian Empire, then of Czechoslovakia. He was born in Prague in 1883, above the Batalion Schnapps bar on the corner of Maiselova and Kaprova, and he spent most of his life living in and around Josefov. Unfortunately, the original building where he was born is long gone, but there is a museum on the site and a memorial plaque with a bust to honour this writer. The museum’s Franz Kafka Exhibition retells his life in pictures and quotes, and also includes artefacts of Jewish life in Prague. At the young age of forty, Kafka died of tuberculosis near Vienna and was buried in Prague’s New Jewish Cemetery.